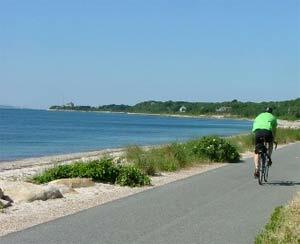 The Shining Sea Bike Path winds along the coastline from Falmouth to Woods Hole. It is a popular scenic route traveled by inline skaters and runners, as well as bikers. The 10.7 mile route is mostly level and is suitable for beginning bikers or families with younger children. Bicycles can be rented at the Corner Cycle shop or Holiday Cycles.